YANGON/BANGKOK (Reuters) - Myanmar's national government has drafted a plan that will give around a million members of the persecuted Rohingya Muslim ethnic minority a bleak choice: accept ethnic reclassification and the prospect of citizenship, or be detained. Most of Myanmar's 1.1 million Rohingya already live in apartheid-like conditions in western Rakhine, where deadly clashes with ethnic Rakhine Buddhists in 2012 displaced 140,000 people, mostly Rohingya. The plan, shared with Reuters by sources who have received copies of the draft, proposes Rakhine authorities "construct temporary camps in required numbers for those who refuse to be registered and those without adequate documents". Many Rohingya lost documents in the widespread violence, or have previously refused to register as "Bengalis", as required by the government under the new plan, because they say the term implies they are illegal immigrants from neighboring Bangladesh. Despite winning praise for political and economic reforms introduced since military rule ended in March 2011, Myanmar has come under international pressure over its treatment of the Rohingya. The plan says one of its aims is to promote peaceful co-existence and prevent sectarian tension and conflict. It includes sections on resolving statelessness through a citizenship verification program, as well as promoting economic development. But rights advocates say it could potentially put thousands of Rohingya, including those living in long-settled villages, at risk of indefinite detention. The government will offer citizenship for those that accept the classification and have required documentation. That may encourage some to consent to identification as Bengali. Citizenship would offer some legal protection and rights to those Rohingya who attain it. But an official from Rakhine State who is part of the committee overseeing citizenship verification said even that would not resolve the simmering tensions between Buddhists and Muslims in the state, or prevent a recurrence of the inter-community violence that plagued the country in 2012. "Practically, even after being given citizenship and resettlement and all that, a Bengali with a citizenship card still won't be able to walk into a Rakhine village," said Tha Pwint, who also serves on the committee that oversees humanitarian affairs in the Rakhine. The plan was drafted at the request of the national government, said Tha Pwint and three other sources contacted by Reuters about the plan. Myanmar government spokesman Ye Htut could not be reached for comment on the plan, despite repeated efforts by Reuters to contact him by telephone and email. Many Rohingya families have lived in Rakhine for generations and are part of a small minority in the predominately Buddhist Myanmar. They are stateless because the government does not recognize the existence of the Rohingya ethnicity, and has to date refused to grant the majority of them citizenship. Accepting the term Bengali could leave the Rohingya vulnerable should authorities in future attempt to send them to Bangladesh as illegal immigrants, said Phil Robertson, deputy director for Asia at Human Rights Watch. "One of human rights' core principles is the right to determine one's ethnic and social identity and this is precisely what the Myanmar government is doggedly denying the Rohingya," he said. "So it's no wonder that the Rohingya completely reject the national government's efforts to classify them as 'Bengalis' because they know that is the starting point for an effort to confirm their statelessness and eject them from Myanmar." The draft plan states that the authorities would request the U.N.'s refugee agency, the UNHCR, to "resettle illegal aliens elsewhere". That might leave them facing indefinite detention, Robertson said, as the UNHCR would be unable to assist. 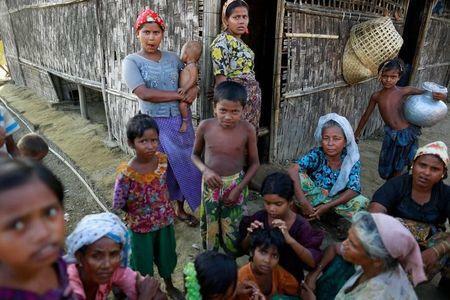 Complying with the government request would be impossible, because the UNHCR only resettles "recognized refugees who have fled persecution and conflict across international borders", said Medea Savary, a UNHCR spokeswoman in Myanmar. "The group in question does not fall into this category." Myanmar is preparing to carry out a state-wide citizenship verification process for the Rohingya as part of the plan, a process it recently piloted. The document says the plan "is a work in progress, with time frames to be adjusted according to the situation on the ground". Almost all Rohingya were excluded from a United Nations-backed census earlier this year after refusing to list their identities as Bengali. The Action Plan for Peace, Stability and Development in Rakhine State also says the government will ask international agencies for help in having the "humanitarian needs met in terms of food, shelter, water and sanitation" for Rohingya living inside the new temporary camps. Myanmar's treatment of the Rohingya is proving a stumbling block to the country's opening to the world since a semi-civilian, reformist government led by former general President Thein Sein took over after 49 years of military rule. In May, U.S. President Barack Obama, who is due to visit Myanmar in November, cited abuses in Rakhine State as one reason for maintaining some economic sanctions.